Major League Baseball and its participating clubs have retired various uniform numbers over the course of time, ensuring that those numbers are never worn again and thus will always be associated with particular players or managers of note. The use of numbers on uniforms to better identify one player from another, and hence to boost sales of scorecards, was tried briefly by the Cleveland Indians of 1916, but this failed. The first team to permanently adopt the practice was the New York Yankees of 1929. By 1932, all 16 major league clubs were issuing numbers, and by 1937, the leagues passed rules requiring it. ^ Team founder and former MLB Commissioner. Number selected symbolically. ^ Aparicio's number was temporarily unretired with his approval for fellow Venezuelan shortstop Omar Vizquel. Vizquel played the 2010 and 2011 seasons with the White Sox. ^ Date of formal ceremony; number retirement took effect at the start of the 2016 MLB season. The number was also retired for all Mariners minor league affiliates at that time. ^ Team founder. The number represents the "26th man"—Major League Baseball rosters are limited to 25 players, except for games played on or after September 1, when rosters are expanded to 40. ^ a b Number was already retired league-wide. ^ Served as president, chairman, or CEO of the Cardinals from the team's purchase by Anheuser-Busch in 1953 until his death in 1989. The number represents his age at the time the number was retired in 1984. ^ The Number 455 was retired in honor of the fans after the Indians sold out 455 consecutive games. It is very rare for a team to reissue a retired number, and usually requires a special circumstance, such as the person for whom the number was retired returning to the team in a player, coach or manager role. Harold Baines provides one example of this when he returned to the White Sox multiple times. The White Sox also re-issued Luis Aparicio's number 11, with his permission, to fellow countryman Omar Vizquel in 2010–11. In cases of franchise relocation, the handling of existing retired numbers is at the discretion of team management. The team may decide to continue honoring the retired numbers (as did the San Francisco Giants), or it may choose to make a "fresh start" and reissue the numbers (as the Washington Nationals have done). When the Florida Marlins moved to their current stadium, Marlins Park, and were rebranded as the Miami Marlins, the number 5, which had been retired for the team's late first president Carl Barger, was returned to circulation because player Logan Morrison requested permission to wear the number to honor his father. ^ Placed into circulation in 2012 when the Marlins moved to their new park and decided to honor Barger instead with a plaque at the stadium. The first player to receive the number was Logan Morrison. Barger was the team's first president, but died in December 1992, four months before the team's first game. The Marlins chose to retire #5 because it was the number worn by Barger's favorite player, Joe DiMaggio. ^ a b c d The Montreal Expos retired numbers in honor of four players (Carter #8, Dawson #10, Staub #10, Raines #30). When the franchise relocated to Washington, D.C., after the 2004 season, the newly christened Washington Nationals chose not to recognize any uniform number retired while in Montreal. On October 18, 2005, the NHL's Montreal Canadiens honored the departed team by raising an Expos commemorative banner listing the retired numbers to the rafters of Montreal's Bell Centre. ^ The Reds retired Hershberger's #5 after his death in 1940, but returned it to circulation two years later. Cincinnati later re-retired the number 5 for Johnny Bench. A handful of players who had notable careers for multiple teams have had their numbers retired by each team. Frank Robinson's #20 was retired by the Reds, Orioles and Indians. Rod Carew's #29 was retired by both the Twins and Angels. Hank Aaron's #44 was retired by both the Braves and Brewers. Reggie Jackson had his #9 retired by the Athletics, and his #44 retired by the Yankees. Rollie Fingers' #34 was retired by both the Athletics and Brewers. Carlton Fisk had his #27 retired by the Red Sox, and his #72 retired by the White Sox. Greg Maddux's #31 was retired by both the Cubs and Braves. Nolan Ryan had his #30 retired by the Angels, while his #34 is retired by both the Astros and Rangers. Wade Boggs's #12 was retired by the then-Devil Rays, and his #26 is retired by the Red Sox. Managers Casey Stengel and Sparky Anderson have also had numbers retired by two teams. Stengel's #37 was retired by both the Yankees and Mets. Anderson's #10 was retired by the Reds, and his #11 was retired by the Tigers. A number of teams have formal or informal policies of only retiring numbers of players inducted into the Baseball Hall of Fame, although there is no league-wide uniformity and teams sometimes break their own guidelines. As an alternative to retiring numbers, many teams have established other means of honoring former players, such as team-specific Halls of Fame (Angels, Astros, Athletics, Braves, Brewers, Cardinals, Indians, Mariners, Mets, Orioles, Padres, Rangers, Reds, Red Sox, and Twins) or Walls of Fame (Giants and Phillies), a Ring of Honor (Nationals) or Level of Excellence (Blue Jays). 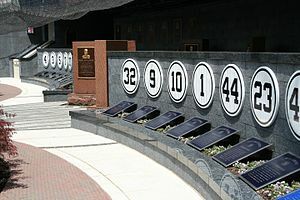 In addition, several teams have kept certain numbers out of circulation since a player left, but have not formally retired them. Some teams have not formally retired certain numbers, but nonetheless kept them out of circulation. For example, the Los Angeles Dodgers' current policy is only to retire the numbers of longtime club members if they are inducted into the Hall of Fame; the lone exception was longtime Dodger player and coach Jim Gilliam, whose #19 was retired when he died of a cerebral hemorrhage during the Dodgers' 1978 postseason run. Nevertheless, the Dodgers have informally kept Fernando Valenzuela's #34 out of circulation since he last played for the team in 1990. The San Francisco Giants have a similar policy, and have kept Tim Lincecum's #55 out of circulation since he departed after the 2015 season, though it is not formally retired. The Milwaukee Brewers have not issued Jim Gantner’s #17 since his retirement. The Texas Rangers have not re-issued #10 since 2012, when last worn by Michael Young from 2002-2012. The number was also worn by Jim Sundberg from 1974-83, 1988-89. The Seattle Mariners have kept the following numbers out of circulation since the departure of a popular member of the team who wore it: #14 (Lou Piniella), #19 (Jay Buhner), and #51 (initially for Randy Johnson, and later for Ichiro Suzuki). Similarly, no one had worn #33 for the Colorado Rockies since the departure of Larry Walker in 2004 until Walker gave his approval for Justin Morneau, a fellow British Columbia native who had idolized Walker as a boy, to wear it when Morneau was with the team from 2014 to 2015. On Opening Day of the 2012 season, the New York Mets unveiled a memorial "Kid 8" logo to honor the late Gary Carter. Although no Met has worn the number 8 since Carter's election to the Hall of Fame, it is not retired. Following Willie Mays' retirement in 1973, Mets owner Joan Payson promised him that the team would not reissue his #24; since then, the only two Met players to wear it have been Rickey Henderson from 1999 to 2000 and Robinson Cano for the 2019 season (with the exception of a minor league call-up named Kelvin Torve, who was inexplicably issued #24 in August 1990 before fan complaints prompted the team to change his number to #39 ten days later). The New York Yankees have not re-issued Paul O'Neill's #21 since he ended his career, except for a brief period in 2008 when Morgan Ensberg and then LaTroy Hawkins wore #21, before fan complaints led Hawkins to change his number to #22 in April. Additionally, the Yankees have held Alex Rodriguez's #13 out of circulation since his retirement in 2016. The Baltimore Orioles have not re-issued numbers 7, 44, and 46 since the passing of Cal Ripken, Sr., Elrod Hendricks, and Mike Flanagan respectively. The team has placed a moratorium on the three numbers in their honors. The Los Angeles Angels have not re-issued Nick Adenhart's uniform number 34, after he was killed in a car accident on April 9, 2009. Detroit Tigers: Ty Cobb, Mickey Cochrane, Sam Crawford, Harry Heilmann, Hughie Jennings, George Kell, Heinie Manush; Cobb's name is displayed on the left-field wall of Comerica Park along with the players and manager whose numbers have been retired; the others have their names displayed on the right-field wall (Cochrane actually wore #3 for the Tigers, and Kell wore three different numbers, but the Tigers have not retired these numbers). The Tigers eventually retired #3, but that was for Alan Trammell, not Cochrane. Ernie Harwell – Detroit Tigers; honored with his name alongside the retired players on the Left-Centerfield Brick wall in Comerica Park and a statue & portrait at the stadium's front entrance. 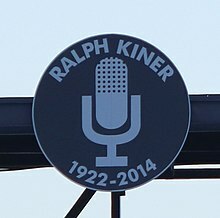 Honored with the Media Center named after him also. Dave Niehaus – Seattle Mariners; the press box at T-Mobile Park was renamed the "Dave Niehaus Media Center" on April 8, 2011 prior to the Mariners' home opener against the Cleveland Indians. In addition, a part of First Avenue NW outside the stadium was renamed Dave Niehaus Way, and the wall in deep right-center field also has a microphone with a Dave Niehaus graphic. On April 8, 2008, the final opening day at Shea Stadium, the New York Mets unveiled a "Shea" logo which was displayed on the left-field fence next to the team's retired numbers. The stadium was named for William Shea, a prominent lawyer who was responsible for the return of National League baseball to New York. Walter A. Haas Jr., honorary jersey retired (with stylized Old English "A" in place of a number) in 1995, located in right field. Owner of the Oakland Athletics from 1980 until 1995. Haas purchased the team from Charles O. Finley in 1980, saving the team from potentially moving out of the area. The names of Paul Beeston and Pat Gillick, the team's first president and general manager, respectively, are list on the Toronto Blue Jays Level of Excellence, alongside the team's retired numbers. ^ Jauss, Bill (September 29, 2003). "Santo: Flag 'my Hall of Fame'". Chicago Tribune. Retrieved November 19, 2010. ^ Schmuck, Peter (September 11, 1996). "Baines' hit season is designated delight DH: Unwanted by the Orioles, veteran shows he's far from through with an '80s-like year for the White Sox". The Baltimore Sun. ^ Gregor, Scot (February 8, 2010). "White Sox unretire Luis Aparicio's No. 11 for Vizquel". Daily Herald. ^ Capozzi, Joe (February 13, 2012). "Miami Marlins un-retire ex-team president Carl Barger's No. 5 for Logan Morrison, but Barger family unhappy". Palm Beach Post. Archived from the original on July 4, 2012. ^ a b c baseball-almanac.com (2009). "Retired Uniform Numbers in the National League". baseball-almanac.com. Retrieved October 2, 2009. ^ MLB Advanced Media (2009). "Franchise Retired Numbers". MLB Advanced Media. Retrieved October 2, 2009. ^ MLB Advanced Media (2009). "Yankees Retired Numbers". MLB Advanced Media. Retrieved October 2, 2009. ^ MLB Advanced Media (2009). "Cardinals Retired Numbers". MLB Advanced Media. Retrieved October 2, 2009. ^ Lukas, Paul. "Some numbers live on forever". ESPN.com. Retrieved September 21, 2018. ^ "Baseball Players with Uniform #s Retired by Multiple Teams". The Pecan Park Eagle. Retrieved September 21, 2018. ^ Jaffe, Jay (June 23, 2016). "Picking the best players whose numbers have yet to be retired in MLB". SI.com. ^ a b Goold, Derrick (February 23, 2015). "Why McGwire's No. 25 is back off the rack". St. Louis Post-Dispatch. ^ a b Schulman, Henry (May 7, 2016). "No one's getting Lincecum's No. 55 anytime soon". San Francisco Chronicle. ^ "Washington Nationals 2016 Media Guide". MLB.com. Retrieved September 27, 2016. ^ Steinberg, Dan (August 26, 2016). "Senators legend Frank Howard is humbled and thrilled to enter the Nats' Ring of Honor". The Washington Post. Retrieved September 27, 2016. ^ Polacek, Scott (September 26, 2016). "Jose Fernandez's No. 16 to Be Retired by Marlins". Bleacher Report. Retrieved September 27, 2016. ^ "Big Unit beats Dodgers 2-1 in Manny's LA debut". Yahoo.com. February 8, 2008. Retrieved August 2, 2008. ^ Harding, Thomas (January 27, 2014). "Walker OKs Morneau wearing No. 33 with Rockies". MLB.com. Retrieved March 19, 2014. ^ "Accidental 24: The Kelvin Torve Interview". Mets by the Numbers. February 11, 2008. Archived from the original on June 19, 2010. Retrieved October 9, 2013. ^ Cohen, Jason (February 26, 2015). "The Yankees need to reissue Paul O`Neill's no. 21". Pinstripe Alley. ^ "Orioles Insider: Guthrie wants to know whether he should keep No. 46 – Baltimore Orioles: Schedule, news, analysis and opinion on baseball at Camden Yards". Baltimore Sun. August 25, 2011. Retrieved November 23, 2012. ^ Cafardo, Nick (December 22, 2015). "Red Sox finally do right by Wade Boggs". The Boston Globe. ^ Araton, Harvey (April 14, 2010). "Yankees' Mariano Rivera Is the Last No. 42". The New York Times. ^ Ruiz, M. Teresa. "SENATE CONCURRENT RESOLUTION No. 27". State of New Jersey. State of New Jersey. Retrieved January 14, 2014. ^ McCullough, Andy (January 29, 2016). "Street is renamed to honor Dodgers broadcaster Vin Scully". LA Times. Retrieved January 30, 2016.